Some communities are resigned to closure of their post offices or cuts in postal hours, but others are choosing to protest. Police arrested a dozen demonstrators sitting in at the Portland, Oregon Post office. Communities have rallied in La Jolla, California, Phoenix Arizona, Albany, Georgia, Syracuse, New York, Baltimore, Maryland and elsewhere. A half dozen postal workers and retirees held a four-day a hunger strike in Washington, DC, demanding that Congress stop the closures and cuts. 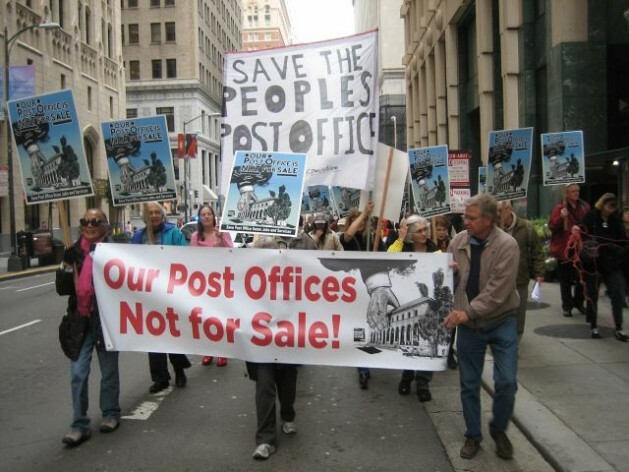 Berkeley activists took their protest across the Bay to San Francisco, marching from the offices of Richard Blum, chair of the commercial real estate giant Coldwell Banker Richard Ellis which brokers USPS post office sales, to the office of Blum’s spouse, Sen. Dianne Feinstein. They’re planning a rally at the end of February to greet USPS officials. The Deadwood post office closure is on hold. Has Hudgins ever used the Post Office? U.S. Priority mail is miles ahead of competitors on price and customer service. $4.90 flat rate for delivery in 2-3 days. The private companies want to take the most lucrative routes and leave the ‘last mile delivery’, the most expensive leg, for the Post Office. 4.90 for the smallest Priority package. To ship a three pound package from Michigan to California is 15.25. I always hear about how the internet has affected first class postage.. but what about all the online sales, ebay auctions etc… that the post office never had until about the last decade? There is definitely waste going on somewhere.